Fontemaggio is a 17th century stone farmhouse villa or 'Casa Colonica' set on a hillside, surrounded by 2 acres of mature landscaped gardens that merge into the sunflowers, vines, olives, pine and cypress trees beyond. There are terraces on all sides, each with its own dining table and breathtaking views of a landscape that seems to have changed little throughout the centuries, including a lake and a Renaissance castle on a hill. Sympathetically restored, the house retains a wealth of terracotta floors and chestnut beams. 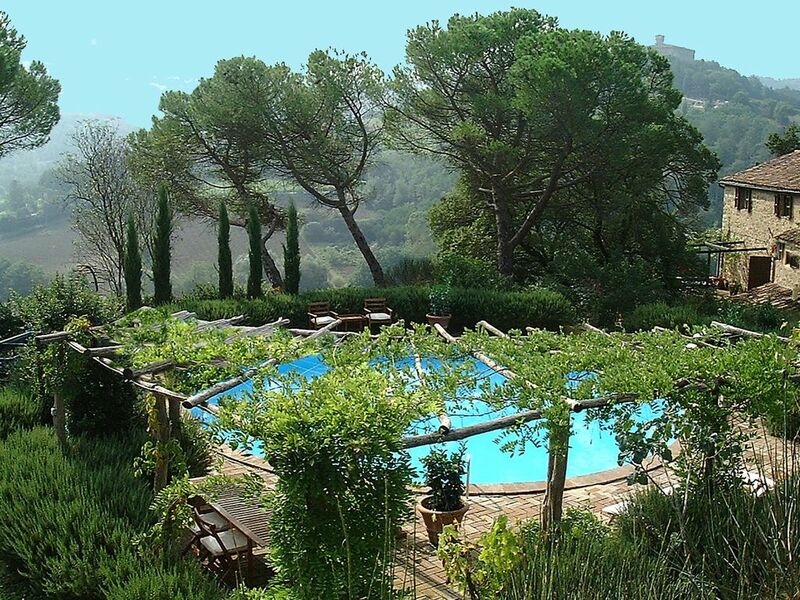 The 30 ft diameter circular pool, surrounded by fragrant rosemary hedging and lemon trees, benefits from the sun for the entire day. Set amongst mature pines, cypress and olives, it enjoys tranquil views of the Tuscan and Umbrian hills in complete seclusion. The medieval hilltop village of Monterchi, featured in 'The Most Beautiful Villages in Tuscany', is close by. You will find Casa Fontemaggio a blissfully relaxing home from home in which to enjoy the pleasures of Italian life. The gardens: the gardens and grounds have been professionally landscaped and contain planting typical of Tuscany. Trees include some very old pines and almonds, cypresses, olives, acacias, oaks, figs and lemons in terracotta pots. There are box, lavender and rosemary hedges. The terraces have pergolas covered in vines, wisteria, Chilean bell-flowers and roses climb on the house walls. A wisteria entwined tiled loggia provides a shady retreat and alternative place to dine. The tranquil sound of running water is provided by a fountain. Situation: although private and peaceful, is not remote. It is well placed to either luxuriate in the excellent cuisine and wines of the region or take trips to the historical and cultural sites of both Tuscany and Umbria. The timeless hill top village of Lippiano, crowned by the castle that can be viewed from Fontemaggio, may be walked to for breakfast or a drink at the friendly bar. 3 km away, the local hilltop walled village of Monterchi, a tiny triangle of medieval perfection, with its intriguing arches and alleyways, is Roman in origin. It is the birthplace of the mother of the famous Renaissance artist Piero della Francesca. His fresco the Madonna del Parto, of UNESCO World Heritage status, can be seen in the old schoolhouse museum. The landscape that appears in Piero's works is clearly recognisable in the views around Fontemaggio. You will find the local community in Monterchi welcoming and friendly, particularly at the general store run by Marcello and his family. There are bars and good restaurants serving local specialities. There is a market on Sunday mornings and in the summer there are outdoor classical concerts. Florence, Siena, Cortona, Arezzo, Assisi, Perugia, Gubbio are all within easy reach. There are two luxury, en-suite bathrooms with travertine marble showers and basins, with brushed stainless steel fittings, and one has a freestanding stone bath. The bedroom suite has en-suite shower room. There is also a cloakroom with toilet and basin. One ensuite bathroom may be accessed from outside the bedroom, making it possible to be shared with the fourth bedroom. Fontemaggio is spacious, airy and has a feeling of a well cared for and elegant family house. The furnishings are neutral toned throughout. There is a dining room with original inglenook fireplace and chestnut refectory table and an adjacent sitting room with library. Two double bedrooms have walk-in wardrobes and en-suite bathrooms. The second double is in a spacious suite on its own floor with sitting room, en-suite shower room and terrace with table and chairs. All bedrooms overlook the gardens and have views to the surrounding landscape. The kitchen and breakfast room, that opens on two sides to terraces, is a blend of modern convenience and tradition. There is a separate laundry room. Guests find it a perfect home from home. We loved it! Highly recommend this property!! This villa was everything we had hoped for. It is a charming property and the floor plan both inside and outside are well laid out. The kitchen had everything we needed; the bathrooms are modernized and the dining room and living/great room accommodated our group quite nicely. The weather was a bit too cool to enjoy the pool but we did take advantage of the patios for dinner when we didn’t go out. The villa with its elevation provides a wonderful view of the Lippiano Castle. Sylvia was very helpful providing recommendations for day trips as well as restaurants. We stayed almost two weeks and had a simply marvelous time there. Thank you for sharing your beautiful home! The house, gardens, pool and views, a total delight! Favorite moments - having our morning coffee on the terrace watching the sun rise, illuminating the hillsides and Lippiano. Bellissimo! If you want an authentic Tuscan countryside getaway this is the place! You will be far enough from the major tourist hubs to enjoy the beauty and peace of country living but close enough to the hustle and bustle if you so desire. I am so pleased that Marilyn and Barry appreciated that Fontemaggio offers rural tranquility and a sense of solitude, yet has easy access to the excitement of Italian life on the street and to the key sites of interest. Bellissimo, sums up Fontemaggio perfectly! We very much enjoyed our week's stay at Villa Fontemaggio. We were greeted on arrival by the extremely helpful owner Sylvia who gave us a comprehensive tour of both the villa and pretty garden with its circular pool. The property is clean and well maintained. We were left a delicious welcome pack containing all we needed the for following morning's breakfast and other treats. The bedrooms and bathrooms are comfortable and well appointed and the living in and out areas are spacious and equipped with a large amount of reading matter appertaining to the area. There are extensive walks, the pool is most refreshing and the garden a delight to sit in. Many pleasant restaurants and bars are to be found a 5 minute drive away in the ancient town of Monterchi, The area is steeped in history and there are many medieval towns within easy access including Assisi and Sienna. We are most grateful to Sylvia for helping to make our holiday so pleasurable. Coming from a fellow holiday rental owner, makes this review particularly meaningful. I am pleased that both the house and garden at Fontemaggio met Diana's undoubted high standards. I am not surprised that the group enjoyed their stay, as the only sound I heard from them was that of laughter. Historically Fontemaggio was reputed to have been popular as a party house and so I am delighted that the spirit lives on! The house and surroundings were absolutely beautiful really in the heart of rural Toscana. The rooms and interior of the house were so tastefully presented and just allowed the house and its charm to shine. The photos don't do the house justice- our kids took a video tour on the suggestion of a friend who came to visit and it gives a much better sense of the space and terrace options-we were spoiled for choice for outdoor seating and eating-sometimes we couldn't find each other such were the choice of terraces! The pool was brilliant, perfect size for swimming, floating or playing and deep enough to dive. Sylvia was a fantastic host, she really helped us out when we needed it and was there to advise and tell us lots of interesting stories about the locale. Truly a holiday to remember, thanks Sylvia!! The Power and Wilson families. Thank you Kay, Ailsa and families for taking the trouble to give your thoughts on your stay at Fontemaggio. The description 'Tuscan heaven' certainly sums up the views of so many guests. I must say these families clearly felt so relaxed and at home at Fontemaggio that they were reluctant to go out! I am so pleased that the property exceeded their expectations. Guests comment so frequently that the photos don't do the house justice, that I really must think about making a video! PERFECTION! What a wonderful family vacation! We could not have been more pleased with our stay at Sylvia‘s beautiful villa! The house is meticulously taken care of. The grounds around the Villa are stunningly beautiful. Private swimming pool was wonderful. Sylvia was a wealth of information and was there to answer any of our questions whenever we needed it. She is such a lovely person. So friendly and welcoming. Her dog Bepo was very sweet as well! Small grocery store nearby that had everything you might need. Wonderful selection of cheeses and meats that you can bring back to snack on around the pool with your bottle of wine. Several restaurants in town that were all wonderful. The small town of Monterchi is quite beautiful. At the top of the town in the square is a lovely restaurant. Has a fantastic wine shop. We sat there and listed to live music with a bottle of wine and a plate of meat and cheese. Tuesdays and Thursdays in the summer time they have live music in the square. The Villa is in close proximity to many beautiful towns. Our vacation was absolutely perfect, due in large part to this stunning Villa we stayed in. The pictures on this website do not do it justice. It is even more beautiful in person. If and when we return to Italy, Sylvia’s villa is the place I will book. Absolutely wonderful. Only thing I would do different is not book the private chefs more than once. It was a novel and fun experience. But for the price we found the restaurants in town to be better food at a much cheaper price. Do not pass this villa up! It was a pleasure to witness the excitement and enthusiasm this three generation family had for Fontemaggio and the local area. Rather than the major tourist attractions they fully appreciated the qualities of Casa Fontemaggio and what was available only minutes away in the local villages. They were rewarded by the great food, conviviality and warm welcome. I am so sorry that the two meals they had prepared by the chefs were disappointing. Had they chosen from the chefs’ well-balanced menus, instead of the more expensive option of customising their own menus , I think, like other guests, they would have had a more satisfactory experience. Nevertheless, they were spoilt by the marvellous selection of restaurants available nearby. It was a real privilege to welcome such warm and appreciative guests who really understood the magic of Fontemaggio and valued the qualities of the local area. Jack, Kim and family, you remain fondly remembered by Beppo and me and continue to be mentioned by the nearby community. What a pleasure it was to see the house and grounds function so perfectly for your extensive and close knit family. Lovers of wine, you also made good use of ready access by car to the vineyards of both Tuscany and Umbria. I so look forward to welcoming you back one day! The local village of Monterchi is in the historic and desirable S.E. corner of Tuscany near the border with Umbria and is therefore an ideal location for visiting the key attractions of both regions: Arezzo 20 min, Cortona 35 min, Perugia and Gubbio 40 min, Assisi: 45 min, Florence, Siena, San Gimignagno: 1 hour. Within easy reach of several international and budget line airports and motorway routes. Golf: There is a golf course, 15 minutes away by car. Negotiable rates are available for long term rentals and late bookings. Non Saturday-Saturday stays may be available outside the high season. Included in the rates are water, electricity and gas (central heating is extra), cleaning prior to arrival and on departure, weekly maid service and change of bed and bath linen and pool towels. Extras include Italian cooks, extra maid service, heating.